The Air-Dock floating boat lift works great with jet boats. Drive the jet boat into the Air-Dock boat lift the same as other boats. See Operation. The intake of the jet boat will not damage the Air-Dock. Method 1 below is preferred but requires a minimum of 2 feet of water at the stern of the jet boat. Method 2 is recommended for very shallow water. Attach the air chamber lines to the forward D-rings on the back of the Air-Dock stern air chambers. Also attached enough weight (usually 5 pounds of steel) to the very back D-rings to sink the material down and away from the jet intake grate. 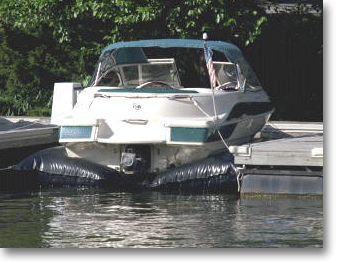 The Air-Dock material will automatically rise to meet the boat hull of the jet boat when the jet boat is raised. Attach the air chamber lines to the very back D-rings on the Air-Dock stern air chambers (without weights). When driving the jet boat in, shift into neutral about 4 feet short. If the jet boat does not coast completely into the Air-Dock, pull the jet boat into place with a rope. To remove the jet boat from the Air-Dock, push the jet boat back about 4 feet by hand, then drive the jet boat out of the Air-Dock.